A Simple Hack for Effective Product Photography. Taking professional-quality product photographs is tricky and for some images you not only need a lot of know-how, you also need a studio, stands and lots of lighting to create the the very best shots. Even images that are isolated on a white background can be shot with quite complex set ups but today we're going to show you how you can create pictures of products isolated on a white background that look fantastic without any complex equipment and no lighting other than what comes through your window and it can't get any simpler than that can it? If you are a creative and make things to sell on sites like Etsy or you buy and sell products, the chances are you will have a better chance of selling more if the photographs are clear and look professional. 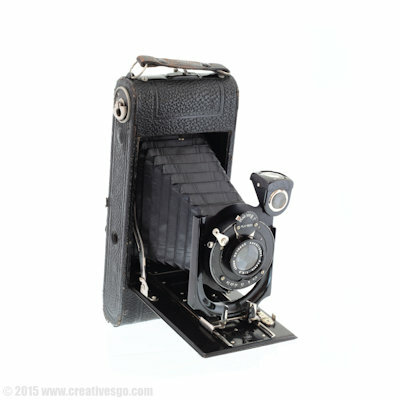 Using the picture you can see here of the antique camera, we are going to describe how we made this image, from start to finish in about 20 minutes. In theory you can shoot this on your phone as long as you can control the exposure, as you need to be able to increase it to +2 stops over what the camera tries to set it to. 2. Something to stand it on. If possible a tripod is ideal but if you don't have that, then something to lean your camera or phone on in front of your product. Doesn't matter what it is as long as you can hold your camera still. 3. Some A3-sized white card. You will put these behind and under your item and also to the left and right so in total, about 4-5. Also depends how big your item is! Make these as white as possible. 4. A clear piece of perspex. This bit is quite important as your items stands on it, stops shadows under your item and lets the white background through. 5. Something clear to stand your perspex on. These let through whilst supporting your perspex. We've used plastic cups as our item is light but if you are shooting something heavy you will need something stronger like perspex blocks. You'll still need to tidy up the picture a little, filling in any white parts that aren't quite white enough and also set basic contrast, sharpness, brightness, white balance, noise and chromatic aberration levels. 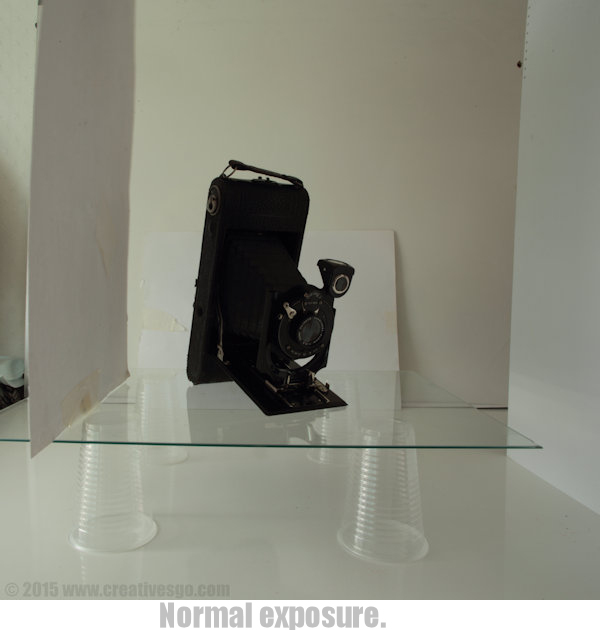 As you can see, our item, the camera, is stood on the perspex supported by our clear plastic cups, with a white background. 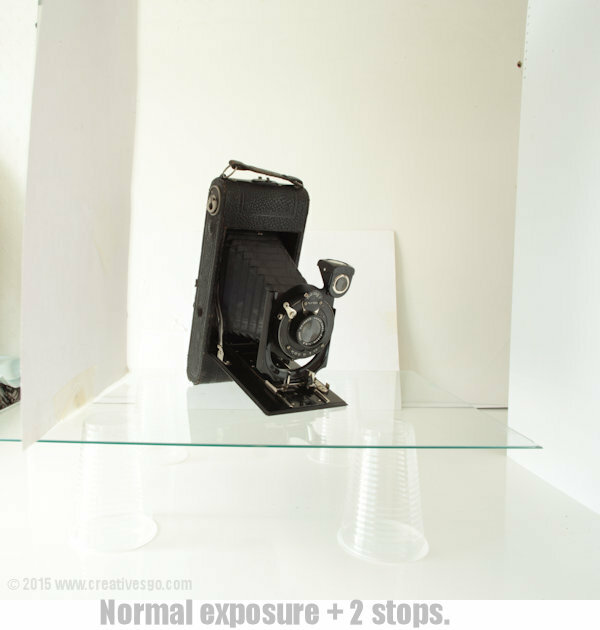 The card behind the item only needs to extend up just about the highest point of the thing you're photographing. The white card is also placed under our item and to the left and right of the item. The window is directly to the left of the scene. It could be to the right, it doesn't matter. Note though, it can't be behind our camera (the one taking the picture, not our subject!) as we'll explain next. A critical component of the set up is the card that's to the left of the item. This blocks the item from the window light but DOESN'T block the background. The white background must be lit completely by the window's light whilst the item is hidden from it by the card. The scene as it's photographed here is as per the aperture-priority settings, so as there's a lot of white here, it's under exposed the scene, hence it looks very gray. The card to the right is bouncing the window light back in to the item and without that we'd have a much darker right-side of our camera. See how those plastic cups let the light flood through and under our item. If you put anything there that isn't transparent you'll block out a lot of light from underneath. Lets look at the scene with that extra 2 stops of compensation to whiten up those whites and pick up the detail in our item. We could add a little bit more exposure here but we can do that in our editor if you prefer. As you can see the item is now much clearer, standing out and the background is starting to appear white. Here we make all of those basic image adjustments such as brightness, contrast, white balance, sharpness, etc to create our final white-background product shot. Increasing the exposure will brighten up those whites, as will increasing the contrast,just don't take them too far otherwise the image will be ruined. In our last image you can see where I was left with just a few parts of the shot that weren't completely white so I used the 'paint' feature of my editor to paint over these with pure white to leave me with the completed product picture you see at the top of the page. Take care not to paint over the top of your item. That undo button is very handy. If you're an advanced user, it's worth noting that the RGB value of white is 255 255 255. Most editors will show you the RGB value of a colour in your picture when you put the mouse over it. This way you can see what's white and what isn't. Finally I've cropped the image to remove some of the white background and to make our item bigger in the image. 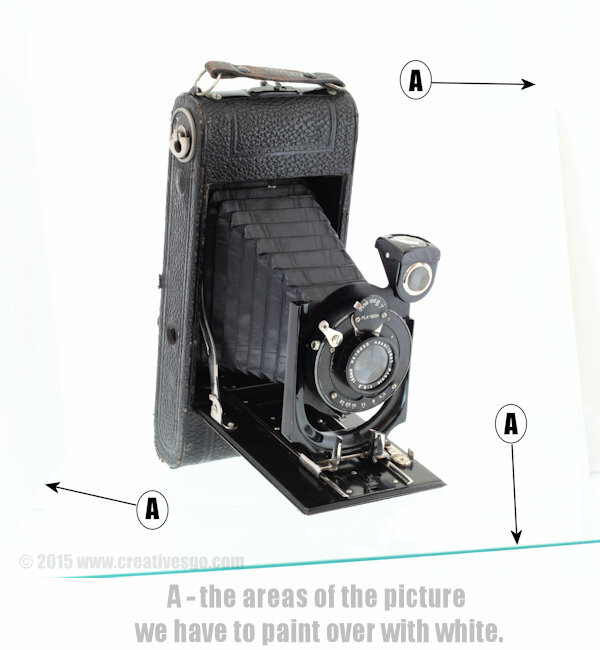 This approach to photographing items isn't difficult but might take a little bit of practice to get right. Also each thing you photograph will also require some thought. Try photographing a very white object and you'll see what I mean!